Facewatch is a private-public system that shopkeepers and the police use to keep track of "persons of interest," a list that includes anyone a shopkeeper doesn't like and registers with the system. 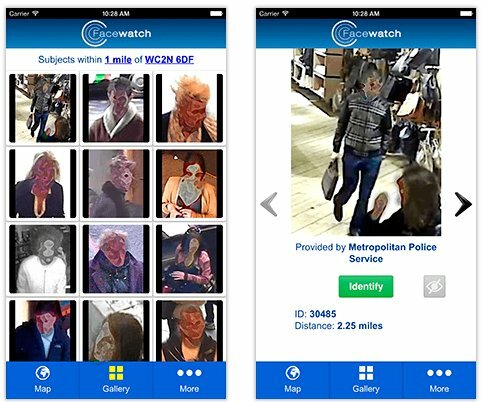 Facewatch is being connected to realtime facial recognition systems that can be tied into the CCTVs of its 10,000+ participating retailers. If your face is on the blacklist and the system recognises you (or if your face isn't on the blacklist and you generate a false positive), the shopkeeper/security staff will get an alert when you enter their premises and they can make you leave. There's no due process for being added to Facewatch's blacklist, no due process for being removed from it. Any of thousands of Facewatch users can add anyone to the blacklist. Earlier this year, we learned that UK police forces illegally colluded with the construction industry to compile a blacklist of trade union organisers, whistleblowers, and people who reported unsafe job sites and to systematically exclude its members from employment. Facewatch lets you share "subjects of interest" with other Facewatch users even if they haven't been convicted. If you look at the shop owner in a funny way, or ask for the service charge to be removed from your bill, you might find yourself added to the "subject of interest" list. Or what if you have been convicted, but have since come out of the criminal justice system a reformed person? Or what if you were convicted of some completely unrelated crime, but still find yourself stalked by a security guard every time you visit Tesco? Or what if you ended up on the watch list because you walked past McDonald's during a democratic protest against the government or police, and then find yourself ushered out of every shop, restaurant, and pub you visit henceforth?